La General Dynamics Itronix progetta computer innovativi ed all’avanguardia in grado di sopportare qualsiasi stress ambientale – da temperature rigide alle condizioni atmosferiche più estreme di polvere, cadute e vibrazioni del veicolo. 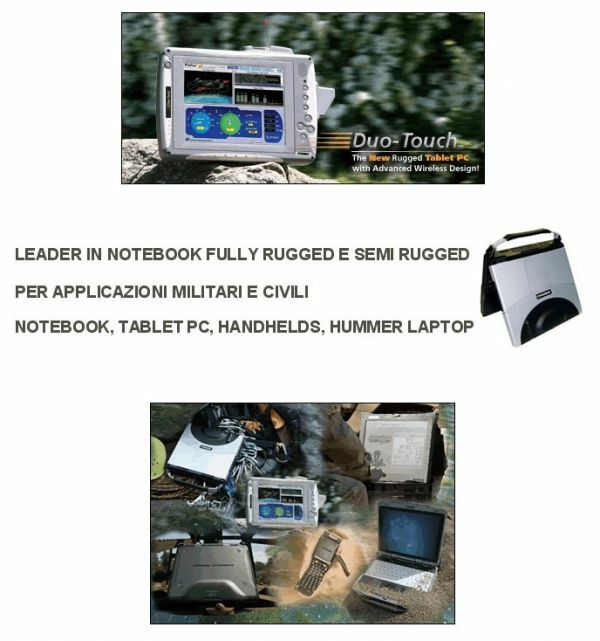 In qualità di fornitore leader di computer RUGGED, le soluzioni proposte da General Dynamics sono le preferite a coloro che operano in field in ambienti ostili. Launched in August 2006, the GoBook XR-1 is the world’s most powerful, multi-wireless, rugged notebook , with smallest and lightest footprint available in a fully-rugged platform! New display technology for increased brightness & improved outdoor viewability. Security: CAC Reader, RF-based fingerprint scanner and TPM 1.2 security options at user and network level. Ergonomically the XR-1 comes with a large 12.1″display, a full sized NiteVue„¢ keyboard, the in latest industrial design, all included in a compact form factor that weighs just 6.8 lbs. Click here to learn why the XR-1 is truly an industry leading computing platform! Launched in September 2005, the new semi-rugged notebook from Itronix sets a tough new standard for this product class. Tough, Powerful, Ergonomic and Multi-Wireless, the GoBook VR-1 has many of the feature sets, and physical attributes common to Itronix’s fully rugged product offerings. Built to withstand the vibration, temperature extremes (up to 140°F), bumps, shocks, and occasional spills that mobile computer users encounter daily, the Itronix semi-rugged GoBook VR-1 notebook was developed to meet the needs of both mobile-office industrial users, as well professional “road warriors” whose notebook must reliably endure the tumultuous and often unpredictable conditions that come with using a notebook on the go. This vehicle-ready product lacks virtually nothing, including state of the art 1.86 GHz Intel Pentium M Centrino processor, up to 4 simultaneous radio options including GPS, 802.11a/b/g, GSM/GPRS/EDGE, or CDMA/1XRTT/1XEVDO. Launched on September 6, 2005 this semi-rugged notebook has received significant press coverage. The NEW Duo-Touch is a rugged, slate Tablet PC, with a user-selectable dual active/passive touch screen that puts the power and flexibility of tablet computing to work in environmentally-challenging situations. Mid-sized, lightweight and ergonomic, the Duo-Touch boasts the rugged and weatherized features you’ve come to expect from Itronix. With up-to-four integrated wireless options in the same device, including GPS, the Duo-Touch is ready for any wireless network. It offers the performance and flexibility needed to keep field-deployed, mission-critical workers productive. Launched in September 2004, the GoBook III was the world’s fastest, most advanced, wireless fully-rugged notebook computer. Performance features include Intel® Mobile Pentium® M Processor 745, removable shock-mounted encased hard drive for data swapping and security, simultaneous support of up to three RF modems (GPRS, CDMA, Wireless LAN or Bluetooth technologies), flexible/upgradable CRMA® radio architecture, and our TFT XGA Outdoor transmissive touchscreen display, making both viewing and data navigation ultra-flexible, and without requiring a mouse. The GoBook III is truly an industry leading computing platform! The GoBook Q-200 is an ultra-rugged handheld ideal for mobile workforces that operate in demanding, mission-critical environments. The Q-200 is the most rugged handheld available anywhere!